Accelerate your exosome studies with these ready-to-use purified exosomes from the human T lymphocyte cell line derived from Jurkat Clone E6-1. Whether you’re looking for exosome standards, performing functional studies, evaluating biomarkers, or engineering exosomes for therapeutic delivery, you can get your research moving faster with our ready-to-use purified exosomes. 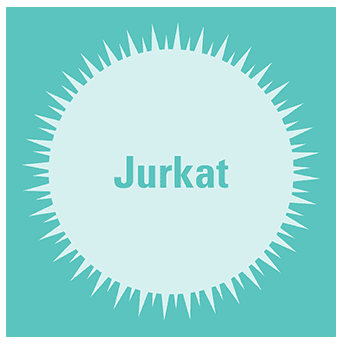 Like all of our purified exosomes, exosomes isolated from Jurkat Clone E6-1, a human T lymphocyte cell line, are carefully manufactured in SBI’s Palo Alto facilities. Starting with cells grown in Exo-FBS (our exosome-depleted FBS) to maximize purity, exosomes are isolated using ExoQuick-TC® and then quality checked by Western blot for the presence of CD63, and NanoSight for particle size and intactness. Provided in amounts > 1 x 106 exosomes (or 50 µg protein equivalent), all of our preps deliver functional exosomes. All exosome preps are checked for the presence of CD63, a common exosome marker, via Western blotting (Figure 1). Figure 1. All exosome preps contain CD63. Aliquots of purified exosomes from the cell lines and from human serum were lysed with either RIPA or M-PER buffer to make exosome protein lysates. Approximately 20 ug of protein for each sample was separated on a gradient SDS-PAGE and then transferred to nitrocellulose membranes. The membranes were probed for CD63 profiles using SBI’s anti-CD63 antibody (cat# EXOAB-CD63A-1) at a 1:1,000 dilution. Bands were detected using the secondary HRP-conjugated antibody at 1:10,000 and blots imaged. All purified exosome preparations were positive, immunoreactive for CD63 with the expected, variable banding patterns common to published exosome CD63 profiles.